On the third Thursday of each month, collaborate with artists and makers, explore unique themes and re-think materials through creative design projects. 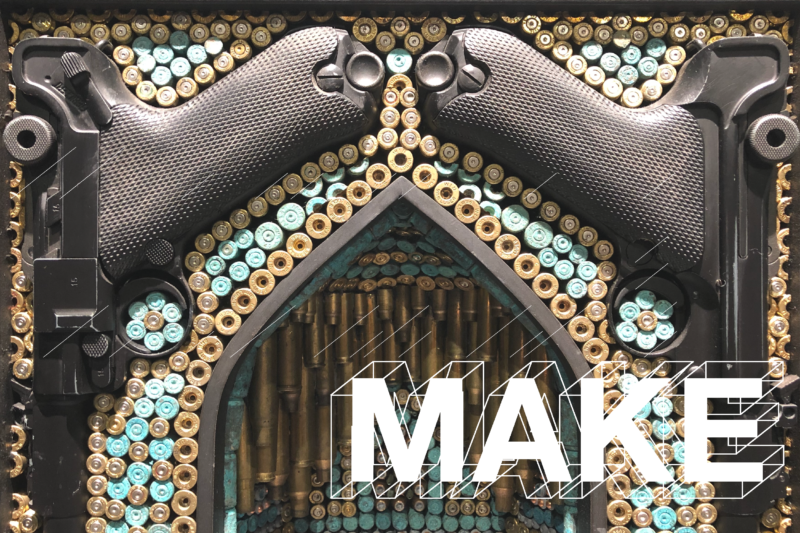 This February, enjoy a final look through Divine Ammunition, where you will honor Al Farrow’s complex and intricate work with a number of in-gallery projects. Wear or carry the spirit of the exhibition with you by creating a peace charm featuring ammunition casings and druzy and quartz crystals, craft a reliquary around a treasured object and play with scale by designing mini structures around found items. Plus, explore the concept of artful meditation with mindful mandalas and transform your creativity into communication with a guided discussion of the exhibition themes, featuring Clearing Conversations founder Misha Bonaventura. *Activities subject (but not likely!) to change without notice.